To say I love to travel would be an understatement. I find pure happiness in exploring new towns, meeting locals, and enjoying the fresh finds of new restaurants. I believe that the only way to travel is to experience a destination like the locals do. Where are the coffee hotspots? Where are the boutiques? Where are the hidden gem restaurants—you know the places that only locals go to eat? Those are the questions I ask myself when I arrive somewhere new. 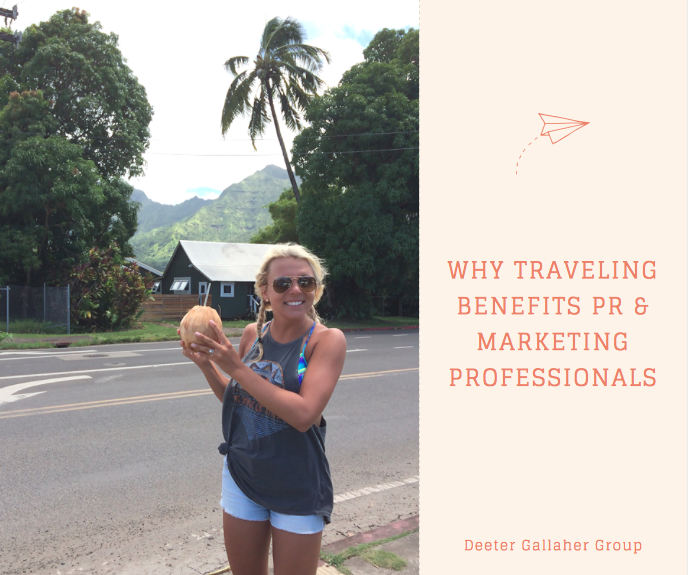 Since I started my career and have immersed myself in the public relations and marketing world, I have noticed something different in my travels. Now, I am constantly searching for new ways of branding, creative forms of communication, and discovering local news and how the locals like to receive it. In 2016, the U.S. Travel Association reported that in total, American residents logged 2.2 billion person-trips* for business and leisure purposes and generated an economic output of $2.3 trillion by domestic and international visitors during travel. With such large numbers generated by the travel industry, it’s no surprise to learn that there are positive benefits to getting away. Traveling improves your health, reduces stress, enhances cognitive skills, and creates emotional connections. What does this have to do with marketing and public relations? Here’s why I believe travel makes me more creative and productive. Every single time I travel somewhere new, I learn a new word. Whether it’s from a regional dialect, a different accent, or simply a new alternative to a commonly used term, like soda or pop, my vocabulary expands. Thank you or mahalo? You all or y’all? My personal dictionary has broadened, which translates into richer language when I’m writing social media content, opinion editorials, brochures, and media pitches. Traveling offers you fresh experiences. Anytime an individual is introduced to a different point-of-view, it opens the doors to a new house of possibilities. In the world of writing, creative services, and development, you can find a new line of originality—test brand messaging, create new slogans or taglines, and produce fresh content. To quote Albert Einstein, “Once you stop learning, you start dying.” Harsh, but true. Education is pivotal in any profession, but in the world of PR and marketing, there is never a moment where trends are not shifting. In order to stay relevant and keep our clients current, we must never stop learning. And what better way to do that than to explore other cities and countries? Take notes on how brands are advertising, what channels are growing, what media professionals are sharing, and what consumers are responding to. What works perfectly in one region may not be evident where your client is located, but it just may be the ticket to their next big marketing move. Even if it’s a business trip, anytime I have my routine altered, it’s an opportunity for a recharge. As communication professionals, we are continuously pushing our creative boundaries. Taking a trip enhances creativity and helps me have a rested, happy, positive mindset. When I travel, whether it’s to a remote town on a Hawaiian island or one hour from my backyard, it provides me a chance to unplug, reboot, and refill my cup with creative energies. Public relations is a 24/7 profession with limited landscape for error. We are always challenged to reach outside our markets to target audiences we don’t ordinarily relate to. As an employee in a creative services firm, I can testify to the positive impact I receive when I travel. In the long-run, it inspires new ideas and conversations for our clients. What destinations have ignited your best ideas? *A person-trip is defined as one person on a trip away from home overnight in paid accommodations, or on a day or overnight trip to places 50 miles or more away from home.